Show Times: April 4th, 5th, and 6th at 6:30 pm, and a matinee performance on April 6th at 1:30 pm. Ticket prices: $10 adults, $8 students (with ID, this includes college students). This show has a content rating of PG-13. For those familiar with ’80s pop culture, the set up is well known. A boy going into his senior year of high school is uprooted from the city life of Chicago to the Midwest town almost devoid of entertainment. What’s worse is that the town has banned rock n’ roll and dancing. The city boy’s challenge to overcome the resistance of an influential reverend in order to put on a party and bring dance back. In Footloose the Musical, Prescott High School’s Fine Arts Department has selected a perfect vehicle for a large teen cast. Teen performers playing age-appropriate parts are certainly in their element. As Ren McCormick, Isaiah Carman plays the lead. Kirsten Cordova plays the defiant teen, Ariel, and Angus MacDonald as Willard provides some good comic turns, and Grant Routson is convincing as Reverend Shaw Moore. 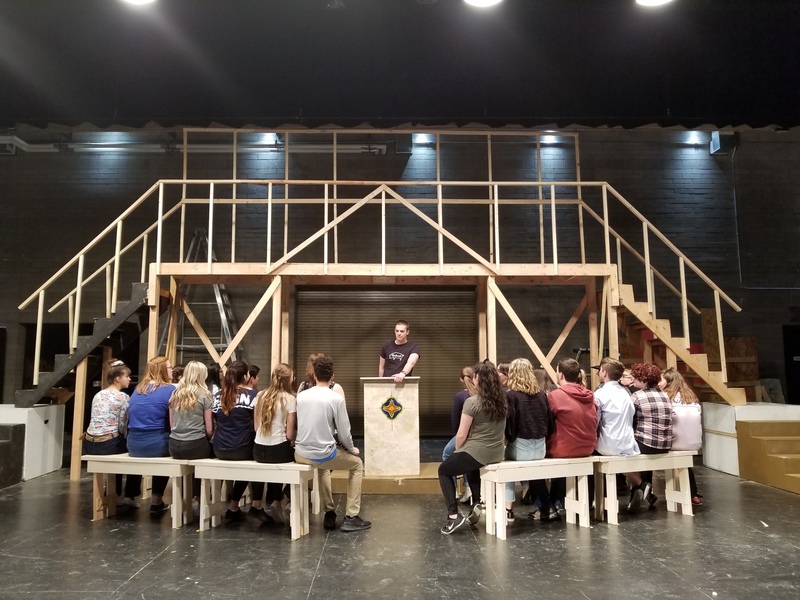 The production demands a great deal of prop and people movement, and PHS Performing Arts teacher and Director, Layla Tenney, orchestrates the elements well. Dori Harnly-Allwein stage choreography creates much of the energy of the show, with fine music direction by PHS Choir teacher, Erin Sobo and stage direction by Ashlyn Braithwaite. But the smiling, rocking, dancing kids bring it to life with the dances and of course the familiar music that we find ourselves singing along – the anthem Footloose, Almost Paradise, and Let’s Hear it for the Boy, as starters.